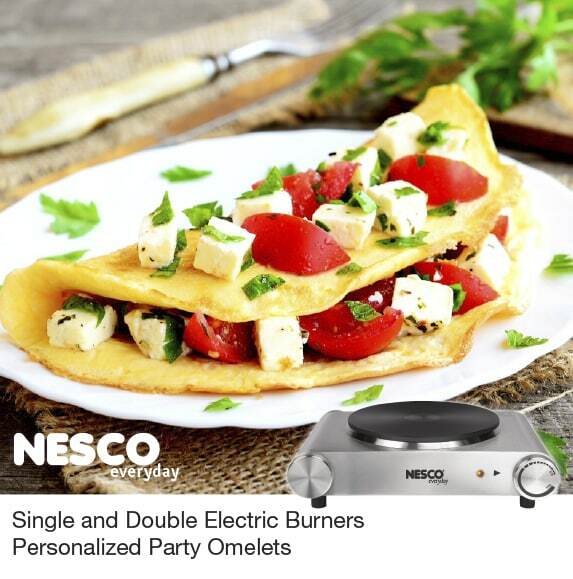 For your next party treat your guests to a personalized omelet made simple with your portable NESCO Electric Burner. Here is a simple omelet recipe and a list of ingredients for the filling. The possibilities are almost endless. Choose the ones that are easiest for you, and ones you feel your guests will love. Pour in beaten egg mixture into pan and cook until edges start to set. Push eggs gently with spatula and tilt pan to let uncooked egg mixture flow onto open pan area. Once eggs look cooked add approximately 1/4 cup of combined ingredients of filling to one side of omelet. Fold other side of omelet over filling and gently slide onto plate. If desired top with additional ingredients from the following list. Let us know what are some of your favorite omelet fillings.